We all enjoy time spent out in the sun, but unfortunately, any exposure to UV rays without the use of sunscreen could be doing irreversible damage to our skin! According to the American Cancer Society, one in five Americans will develop skin cancer by the age of 70. Although these numbers might sound scary, skin cancer has a very high survival rate. The key to successful treatment is to spot the cancer right away. Keep reading to learn about the most common types of skin cancer and how they can be detected and treated. Basal cell carcinoma is the most common type of skin cancer, involving the basal cells within the outer layers of skin. This type of cancer often appears as an open sore or red patch that can be mistaken for a nonthreatening condition like psoriasis. Other times, the cancer presents itself as a shiny bump or slow growing tumor. These often occur on sun exposed areas like the head and neck. Many of my patients tell me it started Luke a pimple. The size of the tumor can help indicate the stage that the cancer is in. Basal cell carcinoma can sometimes be treated with the Mohs surgery technique. This is a highly effective microsurgery technique used to remove the cancer layer by layer until only healthy tissue remains. It gives you the highest cure rate with the least chance if recurrence. The exact course of treatment, however, will depend on the size of the cancer and how far it has progressed. Squamous cell carcinoma is the second most common type of skin cancer and is more aggressive than basal cell carcinoma. Squamous cell carcinoma can appear as a scaly red patch, wart, open sore, growth, or depression in the skin that doesn’t heal. The surrounding skin usually shows signs of sun damage as well with sun spots, laxity, and wrinkles. Squamous cell carcinomas can occur on any area of the body but most often appear on the lip, face, scalp, neck, and arms. Mohs surgery can be used to treat this type of cancer as well, removing the cancerous tissue while preserving as much healthy tissue as possible. Melanoma is the deadliest form of skin cancer, but survival rates are still high when detected early. The cancer usually appears as a growth or mole, although it’s important to remember that most moles are harmless! This can appear on any sun exposed area of your body such as your arms, neck, or hands. You can detect the first sign of this type of cancer by understanding the ABCDE’s of melanoma. This includes Asymmetry, an irregular Border, having multiple Colors, a Diameter larger than a pencil eraser, and a mole that Evolves or changes in any way. Often times melanoma develops in an existing mole, so, if you notice any mole begin to change, you should have it checked out by your dermatologist. Most times, however, melanoma will appear as a new mole, so if you notice a new mole forming, watch carefully for signs of skin cancer. Melanoma treatment will depend on the stage it’s in but will likely involve surgical removal of the cancerous mole. Certain individuals are at a higher risk of skin cancer than others and should take extra caution when it comes to staying out of the sun and examining their skin for signs of cancer. 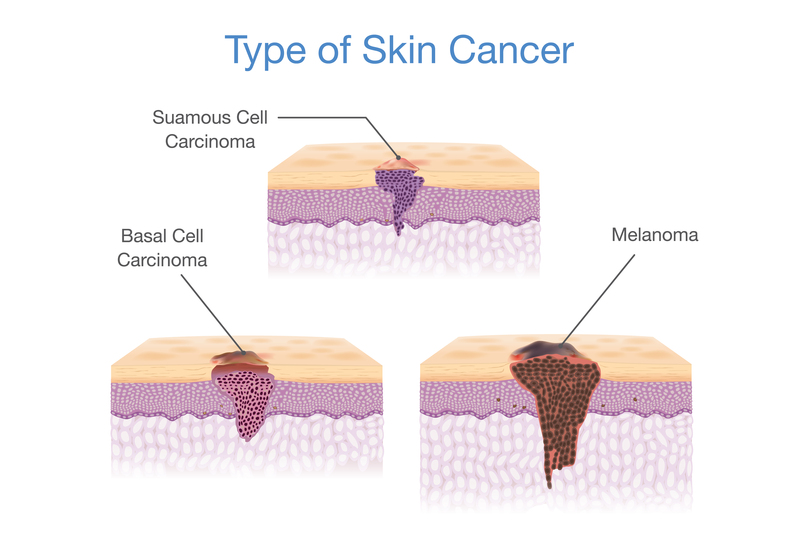 Factors that can put you at a higher risk of skin cancer include having fair skin, a personal or family history of skin cancer, prolonged UV exposure (especially from tanning beds), or a weakened immune system. If you know you’re at a higher risk of skin cancer, self-examination is very important. It is also important to have a full-body exam from a dermatologist for a professional opinion and to examine hard-to-reach areas like your back and private areas. Melanoma can arise where the sun does not shine. Although past sun exposure can do irreversible damage to your skin, you can still protect yourself from future damage! Always apply sunscreen with SPF 30 or higher to any sun exposed areas before going outside. If you can, it’s recommended to avoid over exposure to the sun during the hours it’s the strongest, 10 a.m. to 4 p.m. You should avoid the use of tanning beds completely, as these UV rays are much stronger than natural sunlight, greatly increasing your risk of skin cancer. If you notice any of these signs of skin cancer, contact Jupiter Dermatology right away! Our board-certified dermatologist, Dr. Mejia, can examine your skin to detect signs of cancer and develop the appropriate treatment plan.